This week’s questions are all about general social interaction (next week is social communication). Some of these questions might hit a little close to home for some of us because they touch on trust and vulnerability. Please don’t feel pressured to answer any questions that make you uncomfortable. If you prefer to answer anonymously, you can do so at Survey Monkey. 1. 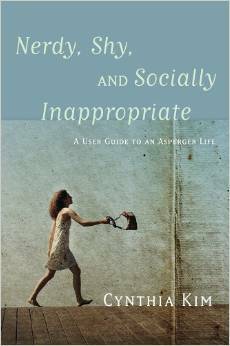 Have you dated knowing you had Aspergers/Autism? If so, when and how did you disclose? How did that turn out? How did you go about getting someone to date you? 2. How often do you like to go out? Do you prefer to do stuff alone? Do you find it difficult to motivate yourself to go out sometimes? 3. Do you talk a lot to people? A lot of books go on about how Aspies can talk the hind leg off a donkey about their pet topics but I don’t have the desire to really talk to people. 5. Do you see yourself as vulnerable because of ASD? Are you more likely to be persuaded to do something or taken advantage of than most other people might? Has your perception of this changed with age? 6. Trusting other people – over the years I have learnt that I am very poor at reading peoples intentions and have been taken advantage of. I have adjusted to this by needing to understand what is happening and needing to be able to logically join up what someone does and says into a consistent picture – or I don’t trust them. How do other people manage this? 7. Do you ever feel like you’re living on a different scale of time from other people? For example, do you hear about a new TV show and only watch it years later because it just didn’t seem urgent? 8. My therapist explained that extroverts gain energy from others and introverts gain energy from being alone, and that autistic people can be either or anywhere in between. She also said there are challenges for extrovert autistics because of the social difficulties making it hard to achieve needed social interaction. (more details) Thinking about it in these terms, where would you place yourself on a continuum from introvert to extrovert? Is this different from how you would think of yourself using the terms in a broader sense, and is this different from how others see you? We’re going to kick off a round of 4 (or maybe 5) Tuesday surveys (yay!) with a set of questions about specific learning differences (UK term) or learning disabilities (US term). All of these questions are by Quarries and Corridors and I have rather selfishly scheduled them first because I’ve been experiencing so many things mentioned here lately and want to hear about your experiences with them. But not worries – I’ll make sure everyone’s questions are included over the next few weeks. The questions are detailed, so feel free to answer as few or as many as you want with as much or little detail as you like. 1. As well as an autistic spectrum condition do you also have a specific learning difference (aka US English ‘learning disability’) such as dyslexia, dyspraxia, dyscalculia, nonverbal learning disability, ADHD etc? 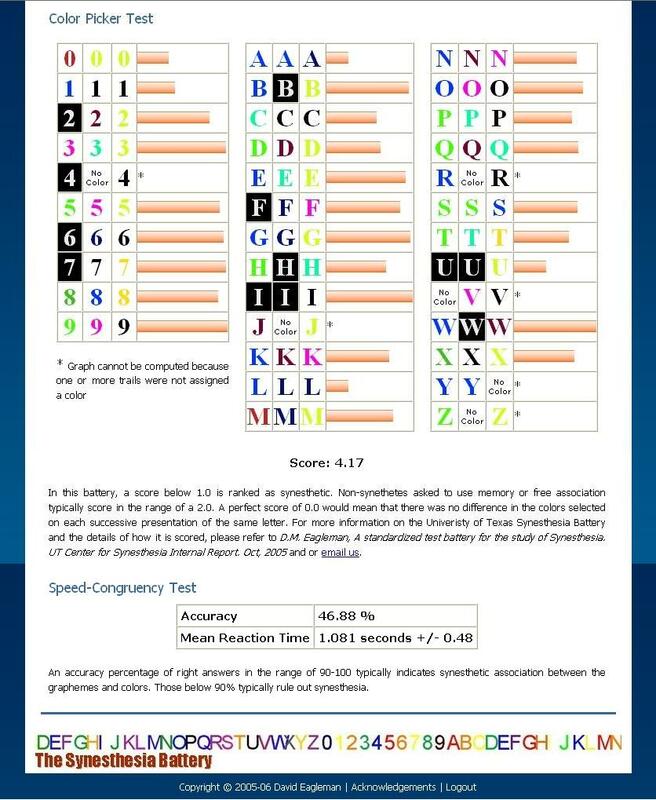 Even if you don’t have a diagnosed/labelled SpLD, do you have cognitive traits commonly associated with SpLDs like slow processing speed, below average spelling, fragile working memory, poor concentration etc? Before I get started, I want to thank ndsenseandsex for mentioning The Synesthesia Battery on Tumblr and inspiring this week’s Take a Test Tuesday post. Even more importantly, I need to preface this by saying that I don’t have synesthesia. The background information for this test is based strictly on research and will probably be quite short. I know there are regular readers who are synesthetes. Perhaps they’ll provide us with some firsthand accounts of their experiences. Finally, if I’ve gotten anything here wrong, please tell me and I’ll edit as needed. Okay, on with the test . . .
Synesthesia is a condition where one sense is automatically and involuntarily triggered by input to a different sensory channel. For example, watching a video of moving dots triggers an auditory sensory response or smelling a particular scent evokes a visual response, such a as a specific color. This means that a certain type of sensory input always triggers the exact same concurrent response, whether you are consciously expecting it or not, and that’s been the case for as long as you’ve been a synesthete (usually since birth, except occasionally in the case of head injuries or drug-induced neurological changes). Synesthesia isn’t an autism trait, but anecdotally, there seems to be a high rate of synesthetes among people on the spectrum. Like autism, it also tends to run in families. The test website has two components: a short pretest you can take to screen for synesthesia and a longer battery that tests for various forms of synesthesia. To take the test, start here. The 7-question screening pretest is optional. If you have no idea whether you might have synesthesia, it’s a quick way to get a better idea. 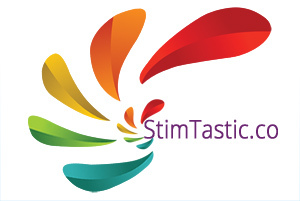 If you experience synesthesia and want to take the more comprehensive Synesthesia Battery, you’ll be asked to register by giving an email address. The site says that results will be anonymously added to a research database and that emails are kept private and never shared. If you don’t want to register and take the Battery but are curious about what it consists of, there is a demo page with some screen shots and demo versions of the various parts of the test. After registering and consenting to be part of the study, you’re asked to provide some demographic information. On the same page, you’ll be presented with a list of various types of synesthesia, with short descriptions of each, and asked to indicate which ones you experience. Based on which types of synesthesia you report experiencing, you’ll be served up a series of short tests. There are both interactive and question/answer tests. Each of the interactive tests lasts about 10 minutes. The interactive tests present a number of trials in which you’re asked to identify the concurrent for an item that is presented. 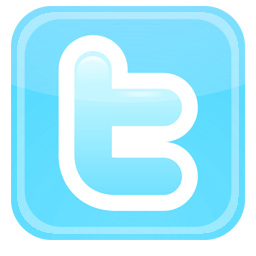 For example, what color does M evoke or what color is this musical note associated with. The same “input” is repeated multiple times, testing how consistent your concurrents are. The length of your test will depend on the number of tests that you’re given. You can stop at any time and come back to finish later by using the account you created when registering. I didn’t take any complete any tests because I don’t experience synesthesia and didn’t want to contribute useless data to the study. I’m looking forward to hearing about any results that you all want to share with us. There are samples of a synesthete’s results page and a non-synesthete’s results page that you can take a look at to see how they compare. There are quite a few synesthesia questionnaires available online, but the interactivity of this test adds a measure of objectivity that is hard to achieve with multiple choice questions alone. 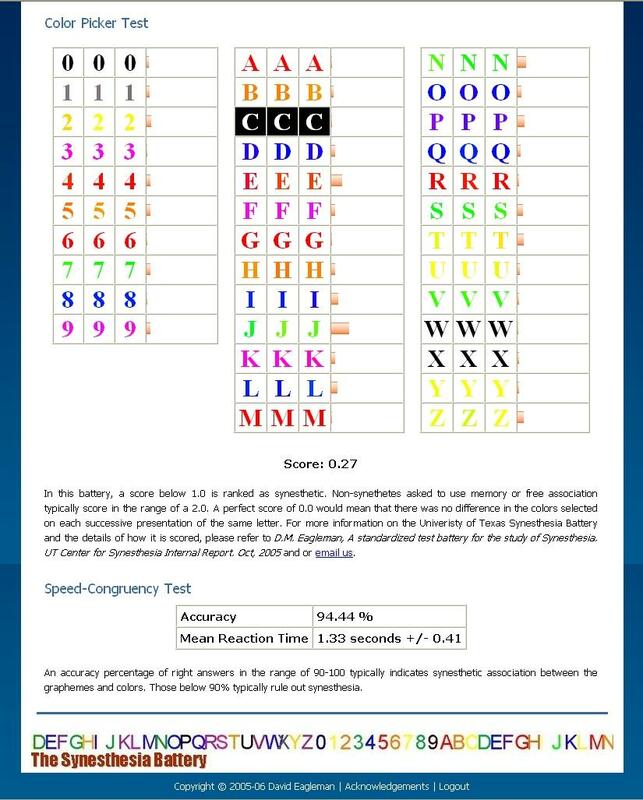 Obviously it’s impossible to test for certain kinds of synesthesia online, since our computers can’t produce scents or replicate all of the possible forms of sensory input that trigger certain kinds of synesthesia, but this test is similar to the ones used to test for synesthesia in clinical settings.